Remember shirts like “Frankie says relax”?? Well, maybe you don’t if you were born in the 90’s since the big bold graphics on t-shirts in the 80’s is what made Katharine Hamnett the well known designer she is now. Ok, maybe not just that. Known for her ethical business philosophy, she also created anti war shirts and has lobbied on changing the standards of apparel manufacturing. 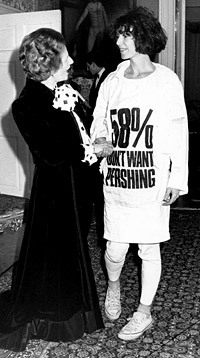 After graduating from Saint Martins college in 1969 she freelanced until she decided to create her own label in 1979. Today, Katharine continues to have a large following and intends to make a change not just locally but on an international level. The latest: In 2008, Hamnett caused some controversy by calling the designers participating in London Fashion Week, racists due to the lack of African American models on the catwalk. Q: What drives you to continue when designing gets difficult? ~ by vilteblogs on November 5, 2010.